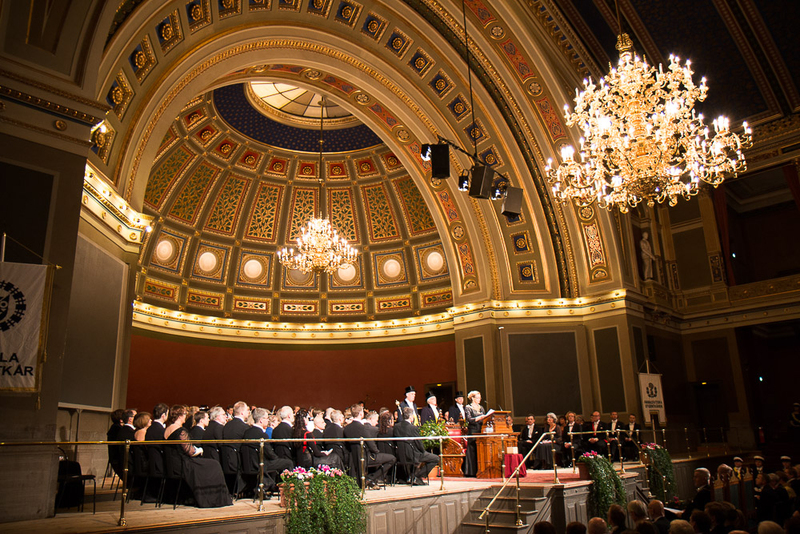 On Friday the installation of new professors and prize awards took place under solemn and festive forms in our beautiful Grand Auditorium in the University Main Building. Mohammad Fazlhashemi: The Paradigm Shirt and Saving Theological Interpretations. Gunilla Enblad: Major Advances in the Treatment of Malignant Lymphoma – But More Remains to Be Done! Thomas Schön: Modelling Dynamic Systems – Automatically Understanding What Is Happening. This year’s winners of the Distinguished Teaching Awards are: Malin Östman, Mika Hietanen, Javad Amid, Mathias Hallberg and Susanne Mirbt. For the first time, the Hjärnäpplet (Brain Apple) was awarded in connection with the installation of new professors. Ulf Landegren, professor at the Department of Immunology, Genetics and Pathology, is the 2013recipient of the Uppsala University Innovation Prize, the Hjärnäpplet. In the evening the festivities continued at the castle, with entertainment provided by the Uppsala Academy Chamber Choir and its director, Prof. Stefan Parkman. Many thanks to all of you who contributed in various ways to yesterday’s celebrations in honour of our new professors and prize-winners!